This EA Sniper Breakout is based on a meticulous breakout strategy and it identifies a "good" support / resistance level in which to place a pending order with a risk 10 pips and a take profit with RR of 1:2,5. The reference timeframe (the recommended one) is M5, and it is valid on EURUSD. The accurate management of trades gives great performances and a low DD! compounding: improve the money management with the risk based on the compounding effect. lots: option to open orders with a predefined lots, specified in the option lots. If is 0, this option is not used. 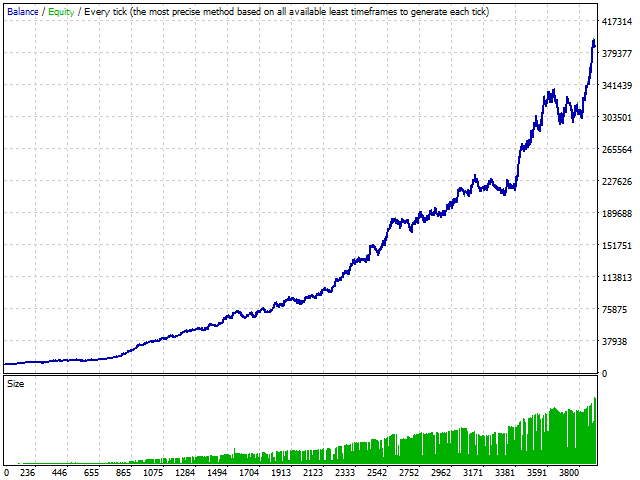 RR: Take Profit calculated throught the Risk/Reward. For example if the SL is 100 Point and the RR is 2.5, then the Take Profit is equal to 100 x 2.5 = 250 Point. 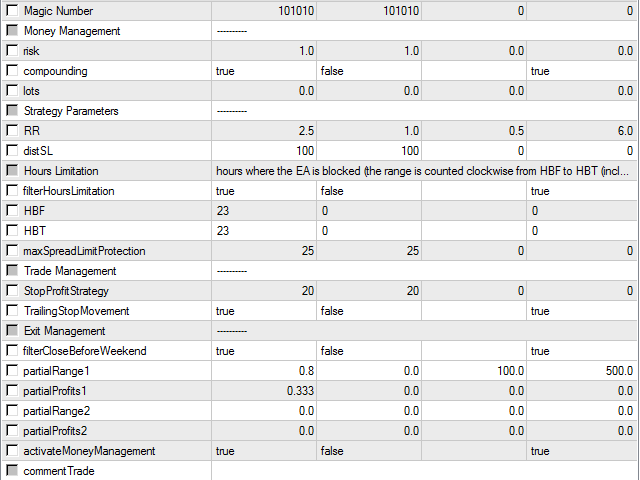 filterHoursLimitation: filter that allows to stop the EA during the specified hours in HBF and HBT (for example HBF 23 and HBT 23 means that from 23:00 to 23:59 broker time the EA is stopped). HBF: starting hour when the EA is stopped. HBT: ending hour when the EA is stopped. maxSpreadLimitProtection: if the spread is larger that this value (in Point), trades are cancelled and the EA is paused (until the spread returns back below the value indicated). StopProfitStrategy: number that define the Strategy of the Stop Loss management during the trade lifetime (leave the default number or put 0 to not use this option). TrailingStopMovement: this option allows moving the SL dynamically (Point by Point) until it reaches the breakeven point. It is a Trailing Stop till breakeven Point. filterCloseBeforeWeekend: if is true the EA close and delete all orders on Friday at 21:00 broker time. partialRange1/partialProfits1: range calculated in percentage from the total distance of the Take Profit (in this case 0,8 x 250 = 200, when the trade reaches 200 Points in profit it takes partialProfits1 0,333 (33% or one third of the position in profit). 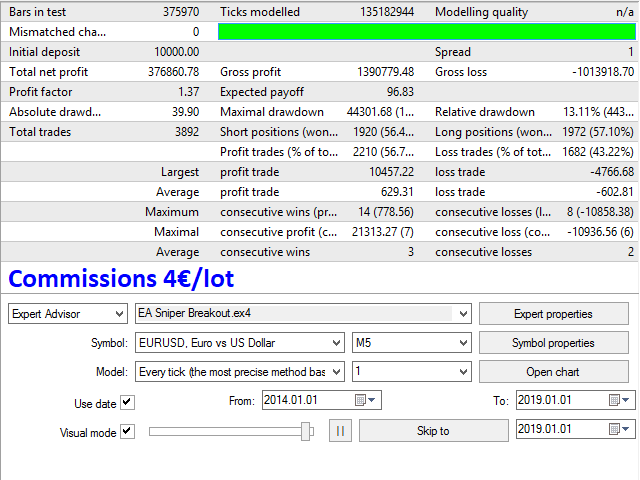 This EA runs EURUSD M5 (default parameters).